Just Joe is a Harlequin Special Release in the More than Words series. 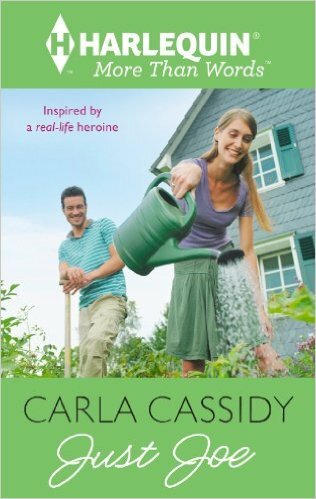 It’s by Carla Cassidy, and was published in 2013. More than Words is a program that recognizes women actively involved with charities. Three women a year get $15,000 to their cause, are featured online, and each gets mentioned in a free eBook. I’ve reviewed one of these before: Good Neighbors, also from 2013. As with Good Neighbors, one of the characters is running a charity similar to the charity run by the prize winner. In this case, Stacy is running a food bank farm, and is inspired by Helen McGovern-Pilant of the Emergency Food Network, in Washington State. I’m mildly curious about how the authors are assigned the work. I assume there’s a phone call late at night, and an intern says “You owe your editor a service.” Or maybe the authors compete for them? Cassidy has written over a hundred novels and knows her stuff. The book is short, but highly readable, with solid plotting and characterization. The action is limited to kisses. Stacy was a poor child with a depressed mother and an absent father. She started the farm with a partner, but he didn’t stay, and she’s spent the last five years focused on her farm. When a new volunteer asks her out for dinner, she says she does not date. Joe is a real estate mogul who is re-evaluating his life after a divorce and other losses. With his reputation, Stacy does not expect him to be a serious volunteer, but he seems to have lots of time on his hands. He’s also prone to romantic gestures. He is sweet, but his persistence borders on stalker. When Stacy points that out to him, he accuses her of over reacting because of her trust issues, and she apologizes. The men in romances sometimes have their own goals, so we get a nice goals in conflict plot, but this is one where the hero’s only goal is to win the heroine. He also wants to rescue her, but without bothering to ask her if she’d like to be rescued. The farm’s in trouble, and Stacy is counting on a plot-structuring dance contest to help out, through prize money, publicity, or hopefully both. Joe decides he’s going to surprise her by helping, leading to various misunderstandings. So we have an independent strong heroine, which I like, but she falls for a slightly creepy guy, who ends up living in her house and showering her with money. Maybe they’ll be happy together, but I sure hope they did a pre-nup. The bubble bath rating is store brand strawberry – short and sweet, with a slightly bitter note.